by Gitelson, Alan R.; Dudley, Robert L.; Dubnick, Melvin J. We just experienced a historic election--driven more by common political myths and less by its realities--that will impact our political and personal lives for years to come. Rather than dismissing those myths as outright falsehoods, American Government: Myths and Realities, 2016 Election Edition, encourages students to confront their preconceived notions in order to think critically about government and politics. Clearly and distinctively woven into each chapter, the myths-and-realities theme provides a pedagogical framework that engages students with interesting questions while effectively covering the core concepts of American government. 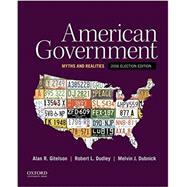 Priced at only $79.95, this affordable best seller provides students with definitive coverage of American government while laying out the foundation for today's generation to have a more sophisticated appreciation for our complex, yet exciting, system of governance. Alan R. Gitelson is Professor, former Assistant Provost, and former chair of the department of Political Science at Loyola University. Robert L. Dudley is a Professor and past chair of the Department of Public and International Affairs at George Mason University. Melvin J. Dubnick is Professor of Political Science at the University of New Hampshire and has taught in a variety of Political Science departments across the country, including UC Boulder, Emporia State, Loyola University of Chicago, the University of Kansas, Baruch College/CUNY, and Rutgers University. Myths and Realities: What are the roles of reason, myth, and belief in American government? "It Just Makes No Sense!" What are the Fundamental Issues of Government and Politics? --Where Should Government Authority Be Vested? Asked and Answered: How Knowledgeable are U.S. Students about their government? How Do We Make Sense of Public Policies and Programs? Myths and Realities: Is the Constitution a living document? Asked and Answered So you Want to Change the Constitution? Policy Connection 2: How Can We Use Models to Make Sense of American Policymaking? Myths and Realities: Do the Individual States Retain Constitutional Sovereignty? Asked and Answered Who is Responsible for America's Elaborate Systems of Roads and Highways? Policy Connection 3: How are Education Policies and Aid to the Poor Affected by American Federalism? Myths and Realities: Do Civil Liberties Mean that We Can Do Anything We Want? Asked and Answered: Do Police Officers Who are Conducting a Search have to Knock and Announce their Presence before Entering Your Home? Policy Connection 4: How Can the Government Maintain its Commitment to Civil Liberties while Minimizing the Nation's Vulnerability to Attack? "We Are Going to War"
Myths and Realities:Does Everyone have the Opportunity to Participate Equally in the American Political and Social System? The Crime of "Driving or Shopping while Black"
Asked and Answered: What Do We Mean by Jim Crow? Policy Connection 5: What is the Relationship between American Domestic Policies and U.S. Foreign Policy? Myths and Realities: Is There Such a Thing as Majority Opinion? Asked and Answered: Are Young People in the United States and in Other Nations Inattentive and Inactive in the Political Process? Policy Connection 6:How Do Public Opinion and Public Attitudes Affect Environemental Policies? Myths and Realities: How Much do the Democratic and Republican Parties Differ from Each Other? Who Belongs to Major Parties and Why? --Independents: Taking a Back Seat in Politics? --If Parties Are So Important, What Do They Do? Asked and Answered:Shouldn't We Have More than Just Two Party Options on the Ballot? Policy Connection 7: Do the Two Major Parties Really Offer Different Approaches to Managing the American Economic System? Myths and Realities: Do Politicians Always Break Their Campaign Promises? --Why Do People Run for Office? --Financing Campaigns: The Buying and Selling of Offices? Asked and Answered: Why can't We Reduce the Role of Money in Elections as Other Nations Do? The Media and Campaigns: Are We Brainwashed? --Who is Allowed to Vote? --Why Do People Vote the Way They Do? Policy Connection 8: Are Elections an Effective Way to Make Public Policies? Myths and Realities: Are All Interest Groups Corrupt and Self-Serving? Asked and Answered: Are College Students Represented by Interest Groups? Interest-Group Tactics: "You Don't Lobby with Hundred-Dollar Bills and Wild Parties"
Policy Connection: How Have Some Interest Groups Been Able to Shape American Public Policies? Myths and Realities: Do the Media have the Power to Influence Public Opinion? Asked and Answered: What are Leaks, and Where Do They Come From? Policy Connection 10: How Do Government Policies Shape the Media Landscape? Myths and Realities: Is Congress Ineffective and Buried Under Partisan Bickering? Asked and Answered: Why are there so few women serving in legislative bodies? Policy Connection 11: What Policies are Responsible for the National Debt? Myths and Realities: Is the President all-powerful? Asked and Answered: What is a Signing Statement? Policy Connection 12: Does the President Really Control American Foreign Policy? Myths and Realities: Are Washington Bureaucrats Unresponsive and Incompetent? Asked and Answered: What are the Plum Jobs in the Federal Government? --What Do Federal Bureaucrats Do? --Where Do Civil Servants Work? Policy Connection 13: Have Poilcymakers addressed the Problems of Incompetent and Unresponsive Government? Myths and Realities: Are Judicial Decisions Completely Objective and Final? Asked and Answered: Are All Judges Selected the Same Way? --Who Becomes a Federal Judge? Policy Connection 14: What Role Does Discretion Play in Our Criminal Justice System?